The Legend of Zelda: Tri Force Heroes game director Hiromasa Shikata explains why the game features three-player multiplayer. 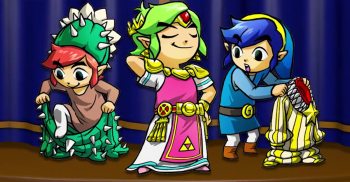 The Legend of Zelda: Tri Force Heroes features a rather, unique, three-player multiplayer system. While not the first multiplayer Zelda, the game is quite adamant on the power of three, unlike the more traditional multiplayer divisibles of two and four (like Four Swords before it). It's certainly a strange number to deal with, but game director Hiromasa Shikata assures us it is quite deliberate and in fact, the only way they could get the game to work the way they wanted it to. The game was initially designed as a 2-4 player affair, but Shikata discovered something rather interesting in testing. "When it was four players, the players split up into two and two and each of them would do their own thing," he told IGN. However, when the number dropped down to three, while the participants did still split into groups of two and one, they always kept within close proximity of each other and helped each other out. Additionally, the game's "totem" mechanic, where the three players can stack on top of each other to solve certain puzzles, didn't really work with four players. "When we tried four players, we definitely wanted to incorporate the totem mechanic, but what happened is that when you totem, the middle two players have nothing to do." Lastly, Shikata revealed a rather bizarre multiplayer feature that was eventually cut from the game for being too unwieldy: hero fusion. Basically, two heroes could do a Dragonball Z-style fusion to power-up their abilities, with the downside of only being able to move in a direction if both players decided on it.